This project was created on 12/26/2018 and last updated a month ago. A reverse mounted red LED, powered by a CR2032 coin cell, is shining through the PCB to provide a bright homing beacon. The board and soldering is all lead-free assembled. Now available in classic and modern. The 1st installment is the classic maps pin inspired by your favorite &apos;show me the way&apos; tool. The 2nd version has the outline of the more modern icon that can be found everywhere by now, even on my milk carton and the location line of your HackADay.io profile ;). A circuit for a quasi-constant current supply is also designed onto the board, to run the LED from 5-20V without a battery. Here the LED can also be controlled by an additional external signal. This requires wires soldered to the pin and makes not as mobile but would be a good option for a more permanent wearable installation. Details about this circuit in this log. And again I got the opportunity to order PCBs, this time from PCBWay. I decided to grow the family of pins and introduce the Classic Pin in Blue. Design files stayed the same as the red one with one exception, I added the name of the PCB order (with a bad typo nicely hidden by the battery :) on the component layer to make sure that nothing got added to silkscreen of the front side. And it sort of worked, as PCBWay added an additional lot number on the component side. So the business end looks wonderful as planned. The order process is as easy and straight forward as you could wish.The order website interface is accessible here (https://www.pcbway.com/orderonline.aspx) and very easy to use. Adding Gerbers, all PCB order info, quantity and additional parameters and pressing order button is done in no time. I opted for the lead-free RoHS plating as those boards are planned to be sold on my Tindie page. This seems to be an open source tool and good on them that they mention Mike Cousins as the creator (Kudos to him for living the open source spirit). The board quality is very good, all pad and silkscreen features came out aligned perfectly as designed. Silkscreen resolution is very high and good enough for artistic features. Soldering was very good, the lead free plating was very good to work with. And it works and looks beautiful. On a few boards, the soldermask was flowing into the big opening on the other side of the reverse mounted LED. I have to rework them, not big deal. For the shipping option I picked E-Packet (10-15 days) and it arrived through Canada Post after 10 days. Perfect. I am really happy that PCBWay gave me the opportunity to testdrive their service and the project fulfillment experience was flawless. If you want to know more about their services, please contact luna@pcbway.com. Here is the (quasi) constant current circuit for operation of the &apos;You Are Here&apos; pin without battery. The current is not absolutely constant. A small term is added to the overall current through the LED. The switch input through J1 is not tested yet, the series resistor R2 might need to be lowered to turn the LED off, when driving the input low. JLCPCB offered me to test their PCB service, so here we go. 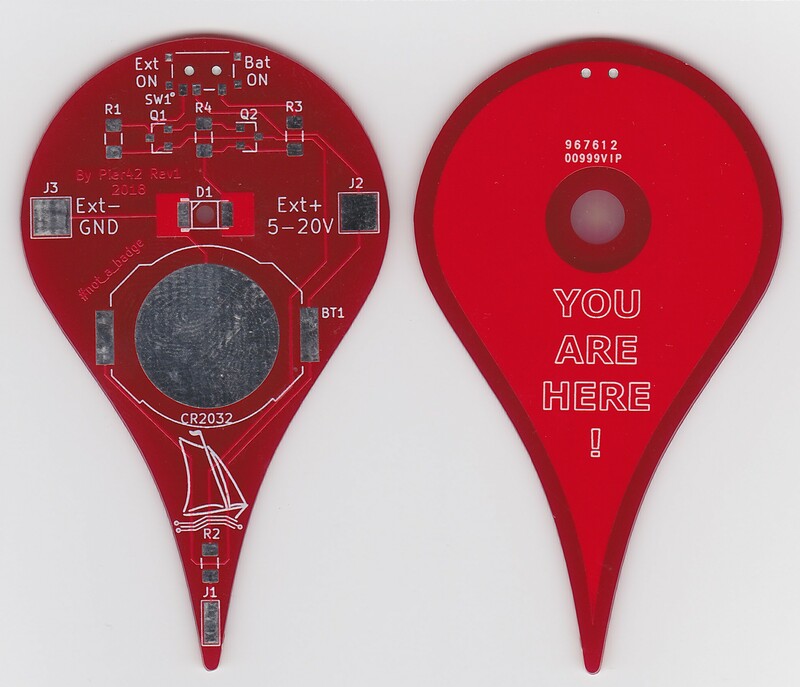 The test subject will be my 2nd installment of my artistic PCB theme named &apos;You Are Here&apos;. This time a modern take on a location pin that shows up on many location features all over our modern life. Quoting and ordering through the JLC web interface is as painless a it gets. You upload a Gerber zip archive, pick your PCB parameters and get an instant price including shipping and an estimated delivery time. It starts at less than 3.00CAD for green boards 10cm x 10cm in standard 1.6mm thickness. My board was slightly more expensive as I opted for red soldermask and leadfree HASL finish, cause the boards might become my second batch of pins to be sold on Tindie. The quality is excellent, all features came out exactly as I had them designed. The PCB layers are aligned perfectly, no overlapping of soldermask or silkscreen onto the pads. Silkscreen resolution is adequate, the rastering only starts showing up slightly on angled lines. Everything was very good to be soldered, even with the lead free HASL finish, I just increased the temperature of the iron by ~30 deg. One very special feature that JLC is offering, is the location selection of the serial number that they are printing on the board during manufacturing. If you put a text string called &apos;JLCJLCJLCJLC&apos; on the desired location on the board, they are going to use it for the serial number. This guarantees visible features to be not altered at all. It is even possible to put this string under a component body and then it will not be visible at all. This is especially helpful for artistic PCBs that should have at least 1 side exactly as designed. Shipping through DHL was without any problems, the boards arrived from China to Canada in 7 days after the order was placed. I got the opportunity to order PCBs from Seeed Studio through their Fusion PCB service. As you can see from the pictures it is a more artistic than complicated PCB and the quality is outstanding. I designed the board with relaxed spec of 7/7mil trace width/spacing and 0.3mm hole size, which fit perfectly in the most price competitive option. Registration of all layers, including soldermask and silkscreen is excellent, everything is centered and no unwanted overlapping onto the pads. Also the PCB outline is routed all the way around and the break-off tabs are not noticeable at all. 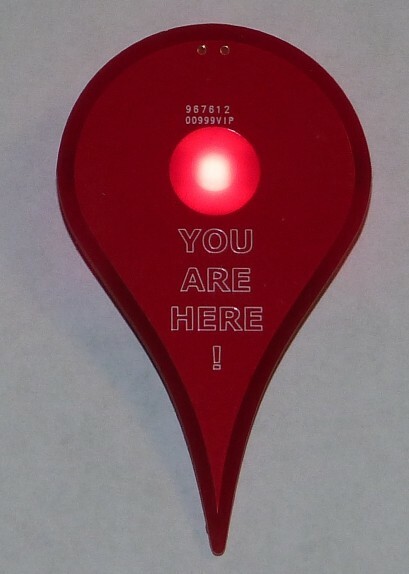 You are about to report the project "You Are Here", please tell us the reason.